To celebrate the opening of the new Fontaine Faucets Yahoo Store, Fontaine is offering new $183.00 MSRP chrome kitchen faucets at the "scary" Halloween sale price of $19.99 each. Need a kitchen faucet, but don't want to spend money like water? The number one private brand seller of faucets and sinks on eBay, Fontaine Faucets, announces that it is now selling a popular $183.00 MSRP chrome kitchen faucet with spray on FontaineFaucets.net at a special promotional sale price. To celebrate the opening of the new Fontaine Faucets Yahoo Store, Fontaine is offering new Danze kitchen faucets at the "scary" Halloween sale price of 19.95 each. Due to the huge demand, buyers may purchase a maximum of two of the $19.99 faucets per household at this promotional price. There is no gimmick. The shipping is only around $10.00 for most U.S. residents. While the faucet made by is a popular name brand, Fontaine is offering this special promotion to reduce the inventory on this faucet, as well as to attract attention to the newly arrived high-end faucets on FontaineFaucets.com, such as the Fontaine Monaco line, which competes with Delta Victorian & Moen Vestige Collections. The new online store also carries Fontaine glass, stone and porcelain vessel sinks, Franke Kindred stainless steel kitchen sinks and accessories such as towel bars and door knobs in matching finishes. The sale will continue through October 31, or while supplies last. The faucet is easy to install, and is economical, but the faucet is not "scary" in any way. While some inexpensive faucets sold online are not certified, thereby posing a potential health risk from lead, $19.95 faucet is fully certified. 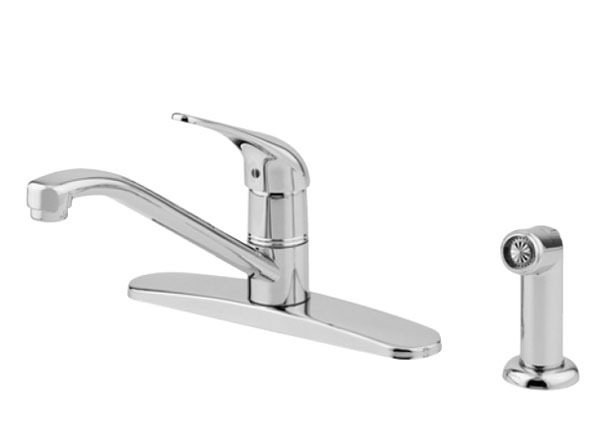 Convenient and easy to install, it's lever single handle faucet with spray in chrome finish, with 8-inch spout reach, solid brass waterways and washerless valve cartridges for smooth and precise handle control. The faucet includes aerator, nuts and step-by-step installation instructions on how to install a kitchen faucet. It is certified ANSI/ASME A112.18.1 - CSA B125 - ANSI/NSF 61 Sec. 9 - IAPMO/UPC, ADA. The faucet has standard 8-inch centers with 1/2-in. IPS connections. To quickly find the $19.99 faucet online, to go FontaineFaucets.net while supplies last. Fontaine is the primary brand and registered trademark of F.S.A. IMPORTS, INC.